Noted broadcaster Paul Harvey died today. The broadcaster was known for his folksy ,down home Oklahoma banter.His columns and broadcasts were very popular in the pre world wide web age. Harvey's commentary was very popular from the 1951-1980's. the 1960's.Harvey was instrumental in his support of Republican policies . 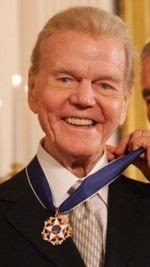 Harvey was known for signing off his commentary ,with the phrase ,"that's the rest of the story".Among the honors that Paul Harvey received was the Presidential Medal Of Freedom from President George W. Bush. As a admirer of broadcasting ,I admire a classic story teller.Harvey was a class act in broadcasting where in these days of bluster ,the Rush Limbaugh's rule.Rest In Peace -Paul Harvey. To paraphrase Paul Harvey,"America you now know the rest of the story". One of my favorite comedians is Sasha Cohen also known as Ali G.The British Comedian takes on Pat Buchanan ,Ralph Nader , and Newt Gingrich. All comedians go off on their deep side ,and here I give these three politicians credit for being straight men in this clever satire with Ali G.
Ali G takes on Ralph Nader and the Green Party and the green movement. 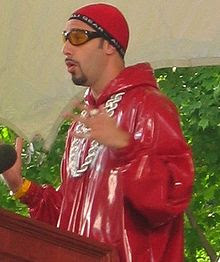 Check out Nader as he tries to be serious and then in the end ,he just succumbs to the Ali G humour. The last clip is Ali G and Newt Gingrich .The former Speaker of the House who shows that he is good sport in this type of humor as he continues to be the serious political professor that he is.Enjoy these clips and many more comedy clips to come. Roland Burris must go.Its no justice,no peace time again.Though it is doubtful that he actually paid for his Senate seat,he did indeed sold his honor out for the sake of political ambition.Honor should always be worth more than power.Burris through his lack of forthcoming honesty proved that dishonest politicians come a dime a dozen.Illinois deserves more,the country deserves more. 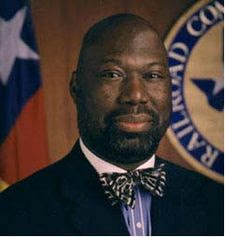 Texas Railroad Commissioner Michael Williams, has recently been honored by the Austin American Statesman. "The Texas Social Media Award" is the latest in Michael Williams honors.This is a award that honors individuals who use social networking technology to reach higher heights. The Texas Railroad Commissioner has been a leading political figure using social media. Not only has he been blogging for years, he's employed Qik.com, YouTube, Facebook, LinkedIn and MySpace among others to keep his constituents informed. But he doesn't leave the work to his subordinates. He uses social media smartly and in a deeply personal way. When he Tweeted just as he was about to go on stage to speak at the Republican National Convention, no one could have been surprised by his commitment to new technologies and ways of communicating. One supporter said of Williams, "His combination of conservative vision, articulate advocacy, and social media engagement will make him a force to be reckoned with in the US Senate." Did we mention he's running for the United States Senate? He's got that going for him, too. Former Congressman Gary Condit ,a long time murder suspect of his former intern , Chandra Levy has been vindicated.Congressman Condit is no longer a suspect, but his reputation died as well.Prayers are with the Levy family as losing a child in a never ending exercise in sorrow. 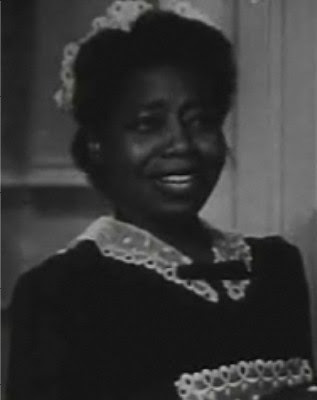 I remember as a kid looking at television shows and counting how many black faces were on television. African Americans historically served only as domestics in the White House. It has only in recent times that African Americans have served as advisers, cabinet officials, and now as the President of the United States. Americans still play the counting game.Its the game where we count how many blacks are in the presidential cabinet, and whether any African American hold a prestigious cabinet position. The days of counting such inane statistics are over. The only concern that I have ,is that whomever is in the White House will perform a quality job. Walking through the doors of the White House now has a different meaning. 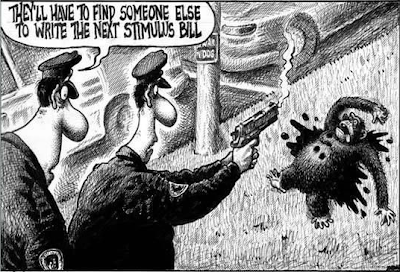 The recent New York Post newspaper published a cartoon in which the NYPD shoots a monkey.The monkey is reportedly is responsible for creating the stimulus package .No doubt this cartoon is refering to President Barack Obama.As an African American ,I have been called a lot of things among them a monkey.This is a blatant form of racism not a form of political satire. 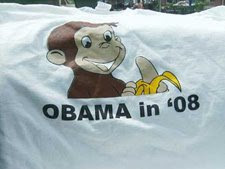 You may remember during the past presidential election the tee shirts that portrayed President Obama as a monkey. Mike Norman ,the Georgia tee shirt maker , defends his portrayal of Obama as curious George the monkey . Racists dating back to the Jim Crow era have associated African Americans with apes. Academic racists have lampooned African Americans as bestial creatures such as apes and monkeys .The New York Post is not the New York Times but it still reaches an substantial audience.American racism will never die , it is like Texas heat ,something that you endure , cope with ,and minimize. 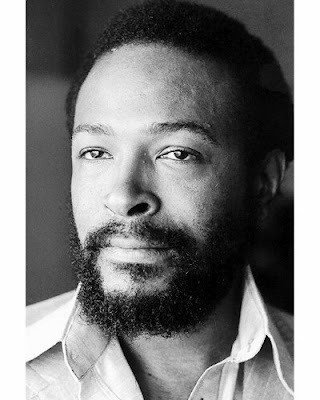 Sunday Gospel : Marvin Gaye Sings "His Eye on The Sparrow"
Marvin Gaye got his start singing in his father's church in northeast Washington DC .He was a classmate of my mother's @ Cardoza High School.Marvin battled many demons in his life ,and it was his lifestyle and family issues that ultimately took Marvin's life.Marvin's roots in Gospel are displayed in this you tube clip. The following commentary is from the web site. Friends of Justice is a nonprofit organization that works to uphold due process for all Americans. Friends of Justice formed in response to the infamous Tulia drug sting of 1999 in which 47 people, 39 of them African Americans, were rounded up based on the false testimony of an undercover agent. Friends of Justice emerged as a coalition of defendant’s families and other concerned citizens who believed the defendants were being prosecuted on faulty evidence. Because of the work of Friends of Justice, the Texas Legislature passed the Tulia Corroboration Bill, which has led to the exoneration of dozens of innocent people by raising the standards for undercover testimony. I am proud to be a friend of Dr. Alan Beam ,a man with Christian principles who when it comes to justice ,he not only talks the talk ,he walks the walk . Tonight PBS 13 will be debuting the Tulia Texas .I highly recommend it. Its Super Sunday ...Go Steelers ! The Pittsburgh Steelers will be my team to cheer for in Super Bowl43. For one day I will join the Steeler Nation , gee ,that's giving me a bad taste in my mouth. But hey I like the Coach .Mike Tomlin is my type of guy ,he is young and animated.Its not about Big Ben or Hines Ward ,it is about Little Mike. Last year, Lynn and and I met with some mutual friends , we spent hours at the fireplace solving the problems of the world .We spent most of the evening talking about politics and the upcoming 2008 elections.I support Lynn if he chooses to run for senator or governor from Pennsylvania again. 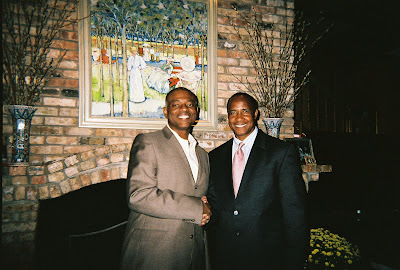 His platform is right for Pennyslvania and right for America .I found Swann to be engaged and politically astute. Super Bowl MVP Hall of Famer Lynn Swann Catches A Miracle ! 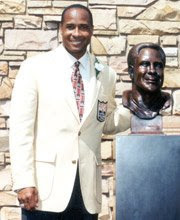 Today,I will support Lynn Swann"s Steelers against the Arizona Cardinals.I think Arizona will be the runner up again ,just like they were last November in the presidential election. Go Steelers ! Two of my favorite entertainers come from Memphis , Tennessee and they are the focus of this weeks Sunday Gospel Music selection .Two southern country boys with with contrasting styles, these are classic clips from back in the day. 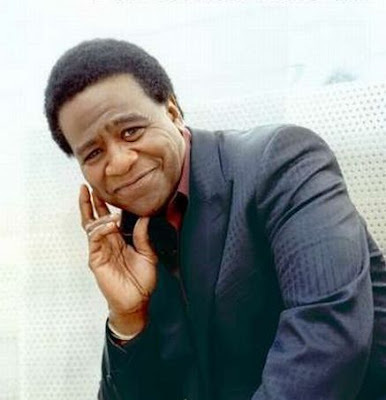 Elvis sings "O Happy Day" with his choir ,and Al Green sings his rendition of "Jesus is Waiting" .Both of these singers got their start singing gospel music and received fame in the secular music industry .Al Green left the secular music at his popularity to preach .The Reverend Al Green still tours today and has his church in Memphis of which I have visited. The other spotlight entertainer is none other than Elvis Presley .Elvis was known during his life time as "the King ". Thats all good but there is no King other than the Almighty! The King of Rock and Roll Sings "O Happy Day "